(SPOT.ph) The scenic campus of UP Diliman is no stranger to playing the backdrop in Pinoy films—what with its canopy of trees and its buildings’ weathered walls. You’ve probably seen the waiting-shed scene in Ulan and the Sunken Garden bench in Alone/Together, and now you can look for your fave campus spots in the upcoming 2019 Cinemalaya entry, Iska. The indie film, directed by Theodore Boborol (Vince and Kath and James, Finally Found Someone), will be screening from August 2 to 11 at the Cultural Center of the Philippines and select cinemas nationwide. 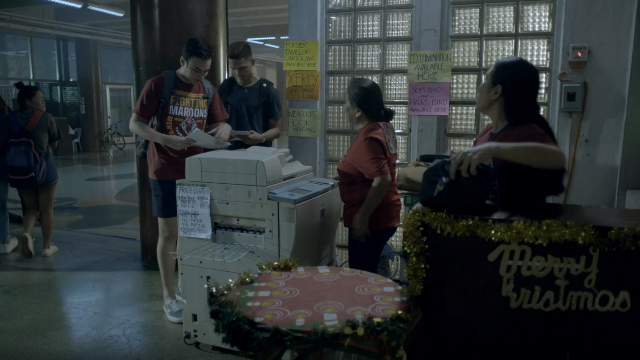 In the short, 30-second teaser, Iska closes up her stall as star basketball players get copies of their readings and pose for photos with her co-worker. The story, loosely based on director Boborol’s house cleaner, is written by Mary Rose Colindres (Para Sa Hopeless Romantic, Be Careful With My Heart). The film is produced by Firestarters Films, the same studio behind the award-winning indie film, 1st Ko Si Third. Iska will be screening from August 2 to 11 at the Cultural Center of the Philippines (CCP) and selected cinemas nationwide.